CMR's first exhibition and official launch, featuring artwork and interactive projects by founding artists. "If not now, when... ?" The pictures are hung, the sculptures are in place, the wine and nibbles are on the table so where are you? It is never a convenient time to have a baby or to start something new. After all, life is busy. We have food shopping to do, bills to pay, children to drop off at school, the dog to take to the vet, jobs that earn the money to cover all the above and …and I am forgetting the flu jab, the self assessment tax form (you’re late! ), the car insurance to renew, the dripping tap to fix , all the minutiae that takes up the 24/7. And that list takes no account of relationships and the coming of spring (we really want to celebrate both! ), the paintings we want to create, the piece half written on the back of the shopping list, the sculpture wholly visualised but only partially created. If not now…when? There is a tall old house in the centre of Redruth which has stood quiet for several years. In its history it has experienced many things. Let me make a guess at some of them. Families making supper by candlelight and arguing over card games and the local gossip with their too close neighbours in the next room, children playing He up and down the stairs before being called to order, and large numbers of objects being stored in the rooms. More lately, people meet to talk about film making, argue about the best way to do it, and sometimes even manage to make films. Then silence for a time, before a voluntary agency moves in and – for no known reason – paints the walls purple. After a time they leave, and silence falls again. The tall house is no longer quiet. Instead there are more noises inside the building as the place is put into order. Cornwall Media Resource is rising like a phoenix from the ashes. It is a space to do new stuff, stuff that is exciting, the stuff of which dreams (or nightmares) are made. There is much discussion, then painting of walls to eradicate the hated purple; the floors and windows are mended and furniture left by the voluntary agency is moved out. The house begins to come back to life again as artists, sculptors, writers and others see its potential and work hard to achieve it. Maybe you will be one of them. Very soon is the first exhibition. We hope you will come to it. We know your lives are busy too. You have all the things to do which cannot wait. This weekend isn’t good for you as your mother in law is coming/you have a big project on/the baby is due/you’ve got a hangover? (You could come next weekend instead, you know! )We understand there are other things in your life you need to do…but if not now, when? 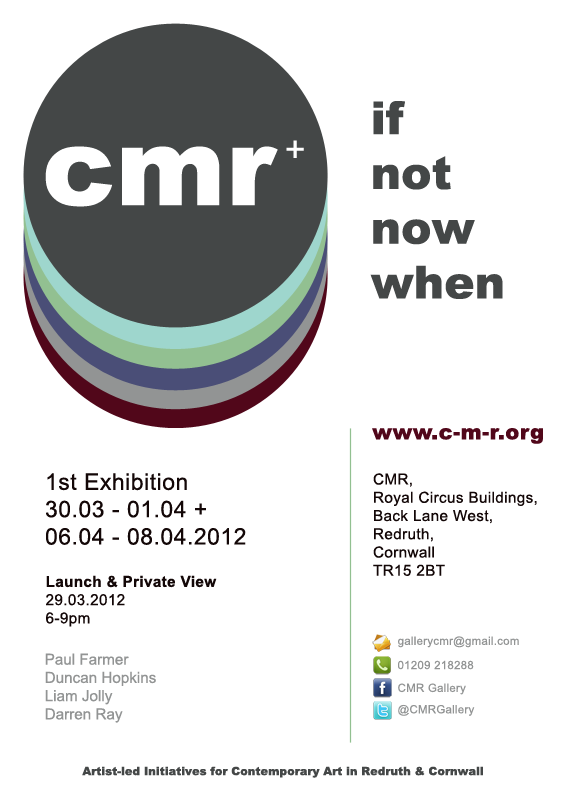 A documentation of CMR's first exhibition and official launch in the heart of Redruth,Cornwall. The exhibition features artwork by founding artists Paul Farmer, Duncan Hopkins, Liam Jolly and Darren Ray, with text by Caroline Palmer. The exhibition showcases film & video, photography, sound, sculpture, painting, text and installation. "Really great show and good to see the space being used to its potential. Can’t wait to see what’s next." "This is an amazing space filled with exciting work and concepts. Inspiring in so many ways. It would be good to take part. Thank you." "Really interesting exhibition. Particularly liked Duncan Hopkins with History painting and You Take My Breath away. Very moving." "Some interesting ideas, well conceived, some parts seem to be lacking a resolution. I look forward to future work. Well done, good for keeping it “real”." "A great use of the space and a fantastic launch for CMR." "Weird but wonderful. Outstanding pictures. I loved the neon pink letter room downstairs and the bubble rap thing." "This seems a wonderful opportunity. Hope to be involved." "Really good to see this exhibition/art in Redruth. We artists need to reach out and reflect to others." "Please contact me for future exhibition opportunities." "An excellent first exhibition in a wonderful versatile space! All the very best for future works!" "Came due to seeing Liam’s message. Really enjoyed such a contemporary project. Please keep me in the loop for future installations." "Interesting work. One piece reminds me of a transformer." "To all at CMR : congratulations – just made it before the doors closed…fresh, exciting…great for the town. Thanks, will be in touch." "It is inspirational to me to find this work today. Would love to meet the artists of the work. Could have spent all day with these works – have found some new spots in my brain today and it feels good." "Great show! Well done, lots of really interesting work and the space looks great." "Really interesting show. Look forward to more." "Very enterprising. Hope you have success."